Want to know exactly where Central Maine Power Co. plans to weave its controversial power line through the state? Maine’s Department of Environmental Protection has the answer. As the DEP reviews the New England Clean Energy Connect project, the agency has published detailed maps of the proposed project area and individual structures for two power lines – one from the Canadian border to Lewiston and another from Windsor to Wiscasset. The maps give a much higher level of detail than maps published, for example, at the website for the project. The Maine DEP has published a more complete project file (as a .KMZ) on its Interactive Maps and Data page, under the title “CMP NECEC Project Layer”. 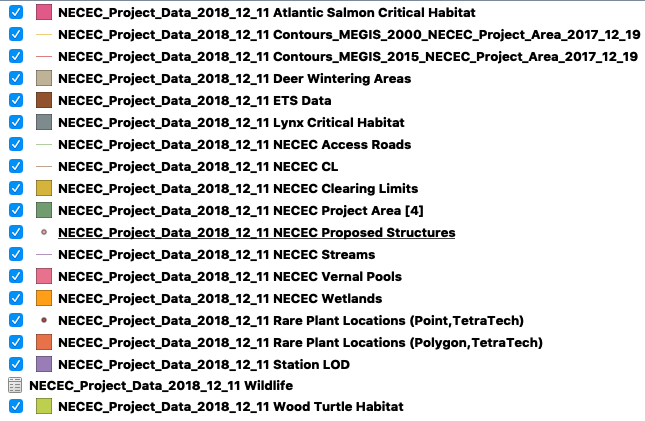 The file was updated last month and includes a range of other data layers, showing where the project intersects with critical habitats for Atlantic salmon, lynx, rare plants and other sensitive environments. A sampling of other layers in the DEP file.